Clinton County Sheriff Ralph D. Fizer, Jr. and his staff recently presented the 2017 Drug Abuse Resistance Education (D.A.R.E.) scholarships to Cara Ann Vinup from the Clinton-Massie School District and Avary Beatty from the East Clinton School District. Each year the Sheriff’s Office presents a $1,000 D.A.R.E. scholarship to one student from each school district that participates in the Drug Abuse Resistance Education program. The money for these scholarships is generated from the arrest and conviction of local drug dealers. “We feel it is important to assist our youth in reaching their educational goals. Using funds forfeited as a result of a destructive lifestyle and turning them into a positive for these deserving students is a great investment in their future,” Fizer said. Cara will be attending Ohio Northern University, majoring in Nursing. Avary will be attending Stevens Institute of Technology, majoring in Chemical Engineering. 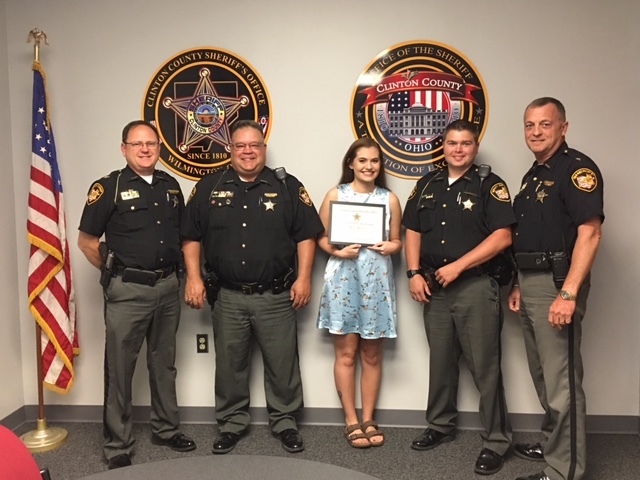 The Clinton County Sheriff’s Office wishes both Cara and Avary great success in achieving their educational goals.